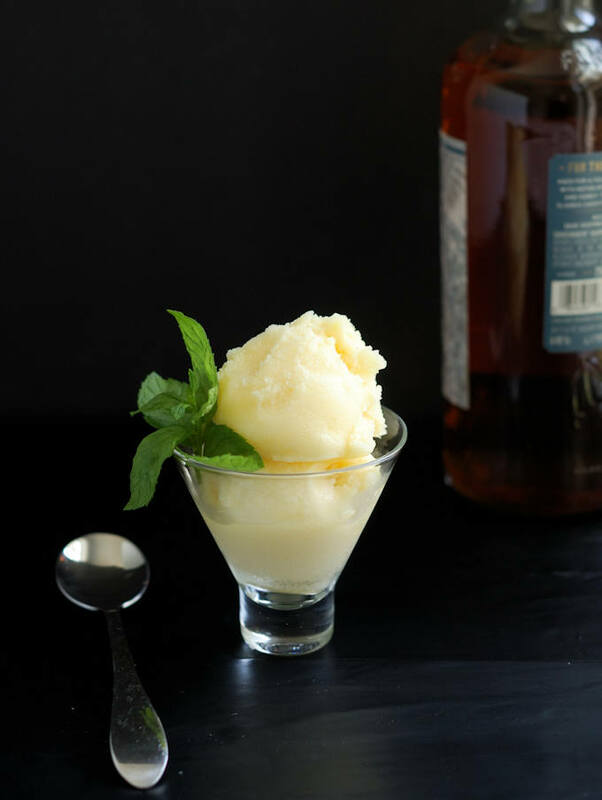 Pineapple Sorbet is a totally refreshing treat with just enough booze to make it interesting! You won’t have to struggle with a spiky pineapple since this sorbet is made with pineapple juice. I just love a good sorbet. Ice Cream is wonderful, of course, but a good sorbet is something different. 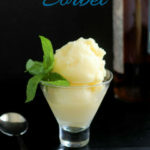 A good sorbet is refreshing and, if made well, will highlight great fruit flavor. 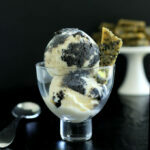 In my Brown Sugar Ice Cream post, I outlined the basics of making ice cream at home. Working with sorbet is a little different than working with ice cream or Frozen Yogurt. Ice cream is made from a base of heavy cream and milk. Frozen yogurt starts with, well, yogurt, preferably whole-milk yogurt. 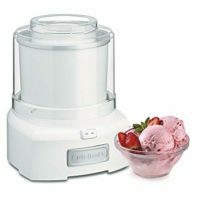 Both ice cream and frozen yogurt have fat in the liquid that forms base of the recipe. The fat in those mixes will mix with the water and help prevent the ice cream or yogurt from freezing into a solid ice cube. How is sorbet different from Ice Cream? Most sorbets start from a base of fruit juice or pureed fruit. I’m working with fruit juice in this recipe because; a) I had a couple of cans of pineapple juice in the pantry left over from another recipe, and, b) pineapples are a bit of a pain to clean and cut up. Whether you start with fruit juice or pureed fruit, it won’t have any fat. We could add a little milk to the mix to help with the texture, but then we’d be making sherbet, or sherbert (you say potato, I say potahto). So, how do we ensure a creamy, not gritty, texture for sorbet without the help of fat? Once again we turn to our fascinating friend, sugar, to give us a hand. As we learned in the Baking School post all about the science of sugar, sugar is much more than a simple sweetener. 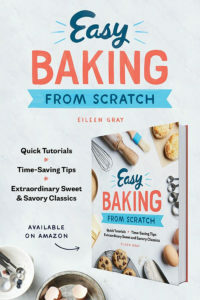 We know it does all sorts of wonderful things for the texture of baked goods. Sugar also does all sorts of wonderful things for frozen treats. Dissolved sugar molecules interfere with the crystallization (freezing) of water molecules. This reduces the freezing point of the fruit juice so it won’t freeze rock-solid. Fruit juice has some sugar in it to begin with, but we need a little more to have enough to ensure a smooth texture. 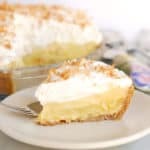 I found that with 2 cups of pineapple juice, 3/4 cup of sugar was plenty, since pineapple juice is fairly sweet to start with. Pineapple also has great acidity so I didn’t need to add any lemon juice to balance out the flavor. 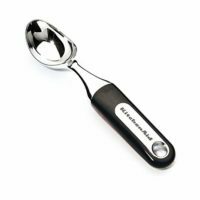 If we were making, say, lemon or lime sorbet we’d probably have to use more sugar and some water to balance out the flavors. Guess what! We have another one of my favorite ingredients to help us make a great, smooth sorbet. Booze! 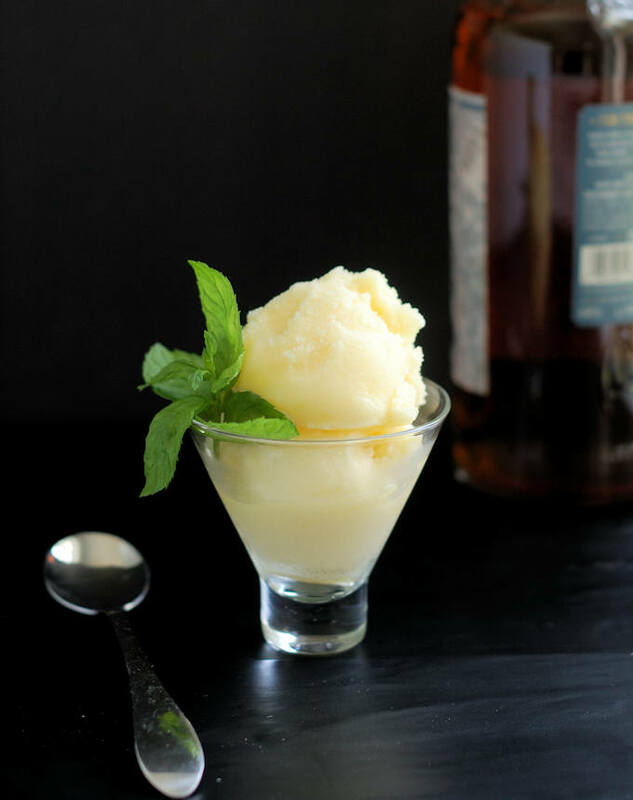 I’ve mentioned again and again why alcohol improves flavor, so adding a little rum to this Pineapple Rum Sorbet is great for the flavor. It’s almost like having a tropical drink. Maybe I should’ve put a little paper umbrella in it! But that little bit of rum also helps with the texture because like sugar alcohol lowers the freezing point of water. Why do we want to lower the freezing point of the water in the mix? The sugar and the alcohol will prevent some of the water from forming ice crystals. Which means some of the water in the sorbet is still unfrozen. This is why ice cream and sorbet are more semi-solid than solid. 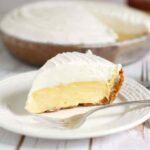 One caution when using alcohol in frozen desserts. 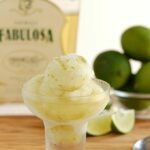 Unlike when I’m making my favorite Margarita, I recommend restraint when adding alcohol to your sorbet or ice cream. 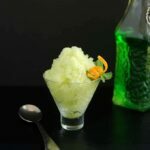 When I was creating the recipe for my Caipirinha Sorbet I had to work my way back from the full-on drink, gradually reducing the amount of alcohol until I got something that would actually freeze. One last note. If you don’t have an ice cream maker you could turn this same recipe into a granita instead of a sorbet. Read the notes in the recipe card to see how to create a granita. 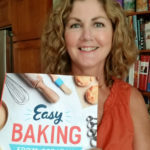 If you love this recipe as much as I do please consider leaving a 5 star review. 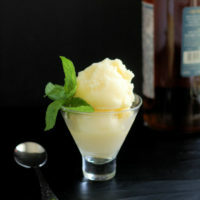 Pineapple Rum Sorbet is a totally refreshing treat with just enough booze to make it interesting! This sorbet made with pineapple juice, so there's no need to struggle with a fresh pineapple. Combine all ingredients and stir until the sugar is melted. Chill until very cold, at least 3-4 hours or overnight. When the sorbet is ready, transfer it to a plastic container. Place a piece of plastic wrap directly on the surface of the sorbet. Cover the container and freeze until the sorbet is solid, eat least 6 hours or overnight. If you don't have an ice cream machine you can turn this mix into a granita. Pour the mixture into a 13"x9" metal baking pan. Set it in the freezer for 30 minutes. Remove the pan from the freezer and use a fork to break up and stir in any ice that has form. Continue this process, breaking up ice every 30 minutes, for 3-4 hours until the granita has the texture of a snow cone.